क्या सच में रावण के पुतले को जला देने से सब हो जाता है? Parents always wish to imbibe good habits in their kids, so from the early age, they try to make them understand the importance of manners and healthy habits. For example; timely schedule of sleep, cleanliness and physical exercise. Now if I talk about toddlers and pre-schoolers, they already do so much of physical playing every day. You can find them running and jumping here and there without any reason. Howbeit, other two habits, a fixed schedule of sleep and cleanliness need to be taught to them. It is very evident that kids do what their family members do. Therefore, if family members are following healthy practices in life, kids automatically start pursuing them. Toddlers do not really understand why they need healthy habits. It’s mainly their family members who make them understand how to assimilate good habits in their routine. Kids need an age-appropriate reasoning for explaining them the importance of healthy lifestyle. Let’s discuss one such habit, brushing the teeth. Now with other healthy and hygienic practices, we also need cleaning of our mouth every day. Nevertheless, many times toddlers do not really like to clean their teeth. Some of them hate putting the brush in their mouth. Other may hate the taste of the toothpaste. So, parents often force them for brushing. No one enjoys the visit to a dentist and this fear also makes parents yell at kids for cleaning their teeth. However, for toddlers forcing does not work. They even hate more if you force them for somethings. 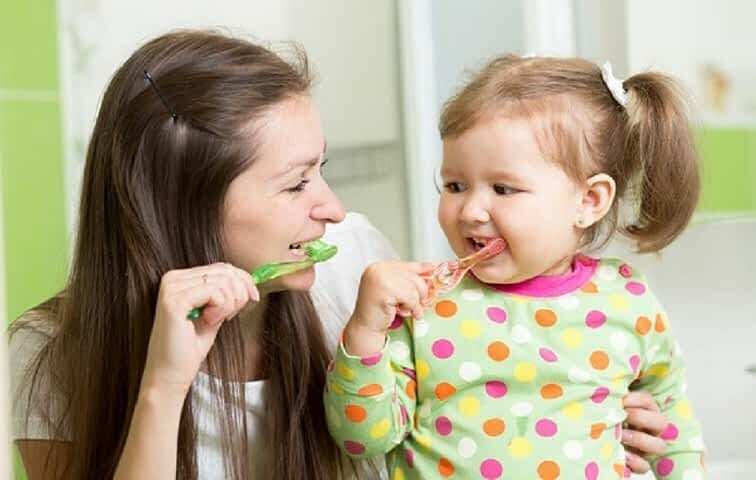 Thus, parents need a few tricks to make their toddlers love brushing and accepting it in their daily routine. This thing really works as I have seen my son liking his teeth cleaning just because his parents do it every day. I used to brush my teeth in front of him ever since he was only a year old. In next few months, he showed the willingness to try it himself. And this tricks worked for us. He started cleaning his teeth since he was only 1.5. Start following it as a practice to be followed before bathe or before going to bed. Even if your kid refuses to do it initially, keep on trying it every day. Slow and consistent efforts would definitely work. When I started tooth brushing for my son, I avoided giving him toothpaste. I only got a super soft toothbrush for him. He used to move the brush inside his mouth with noticing me how I did it. Most of the kids hate the taste of toothpaste so start giving your kid a small quantity only after he/she understands using the toothbrush. I used to make the story for my son when initially he was learning to use the toothbrush. He used to enjoy it so much. Same ways, you can make stories, songs or a new play around this whole tooth brushing time. How about “Brush in the mouth go round N round..” ? Toddlers enjoy everything, which is a fun game. Kids find their own way of enjoying tooth brushing so don’t force them too much for the right method of cleaning teeth. Gradually explain to them where to take the brush and the directions of moving toothbrush. You can even play “Copy Cat”. Have your kid copy you in the mirror as you brush. If my son ever denied cleaning his teeth, I offered him cleaning my teeth. I gave him my toothbrush, and used to say “now it’s Vibhu’s turn to brush Mumma’s teeth”. After a few minutes, he used to be okay with giving me the turn to clean his teeth. So, the refusal may happen, but you need to find the way in which your kids can forget about his refusal. These are some of the tricks to how to make Toddler Brush his teeth. Apart from this, you can take help from different books, videos, and comics available for toddlers. They explain the importance of cleaning the teeth in very attractive and kid-friendly way. With watching the videos, kids can try to mimic how to use the toothbrush. In addition, there are many kinds of toothpaste available in the market which are made especially for small kids. They have a very good taste and a balanced formula which is recommended for kids under the age of 5. Please remember, you can win one battle at a time. So don’t try any other habit, when you are teaching your toddler tooth brushing. He or she may feel it frustrating. Kids can learn anything if you are ready to try it with patience and love.